Markets.com welcomes South African traders with access to buy/sell trends and real time quotes. The software is user friendly, and provides an informative view of not only the happenings in the market, but the application itself and how to use it optimally. The Sirix WebTrader web platform synchs seamlessly with your Meta Trader 4 account, giving you access to the market`s action from any computer, at any time. All of the trading functions are available to trade successfully from anywhere, which promotes optimal conditions for accomplished trading. 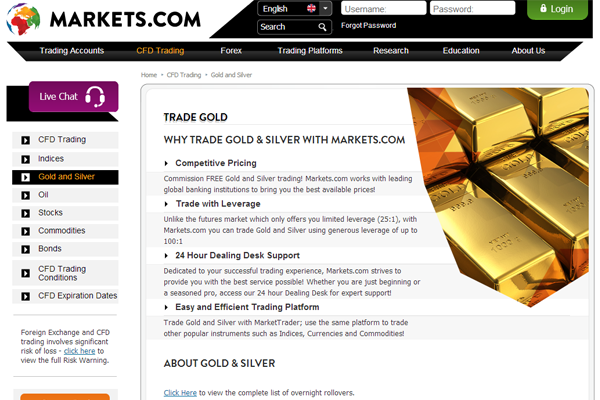 With the variety of training that Markets.com provides, South African traders can access stocks, bonds, oil and commodities, gold and silver and Indices as if they were on the Wall Street themselves. Markets.com provides the perfect opportunity for traders to take the bull by the horns by allowing free training webinars, and access to a $100,000 practice account to help familiarize everyone with the software risk free. Markets.com has an accomplished support staff that is available instantly through a useful FAQ area on their site. If you cannot find the answer you are looking for, they are available by phone and email where you can contact the exact department you want to reach, without being transferred over and over.